Practice in Time: All Aboard the Polar Express! Last Saturday my mother treated Jayson, Kate and I to a trip aboard the New Hope & Ivyland Railroad's "Polar Express" train. 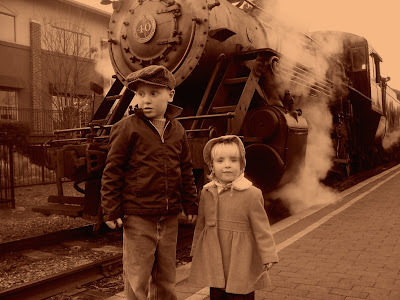 We rode aboard a coal-fired locomotive built by the Baldwin Locomotive Works of Philadelphia in December, 1925 and several 1920's vintage passenger cars. The route the tracks took between two Bucks County villages was historic as well, being used as the setting for the 1914 movie serial "Perils of Pauline". The excursion is geared to families, obviously, so the train was packed with kids in their pajamas (like in the movie) but we chose to dress in vintage to suit both the time period of the train and the setting of the movie. The interior of the train is as it would have appeared in the 20s and 30s. Note the sign: "No smoking. Spitting is prohibited." Santa greeted the kids on board! The kids with Grandma- thanks, Mom, we had a great time! The purple items are their tickets- if you've ever seen the movie, you understand why they look like they're holding on to them for dear life! This is the money shot- about once in a thousand pictures do I get one like this! That's so great! We took the kids to that last year and got pictures with Santa and Mrs. Claus. Then we went out for lunch in New Hope. I remember the hot chocolate being really good! That is so cool! We took our boys to Strasburg a couple summers ago and it was so fun. I esp love the last photo! I especially adore the last photo. They have one of those Polar Express train rides in the Cherokee Mt area not far from me. We've taken the fall train ride and really enjoyed it. But to be a kid and to take a train ride has to be an unforgettable time. What an awesome G'ma for sending you all on one. BTW "The Polar Express" is one of my favorite movies and I understand the reason for holding tight to those tickets! Very cute. The polar express in the movie is actually a digitally enhanced version of a train that's in my home town - the 1225. Needless to say, holiday rides are very popular there! Val- yes my mom told me it used to be on the MSU campus, where she went to school in the 60s. I think the author is a Michigander?